Every database management system must define a query language to allow users to access the data stored in the database. 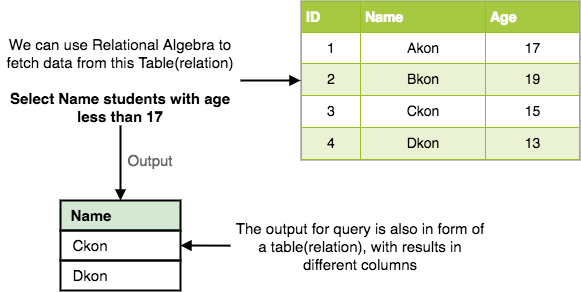 Relational Algebra is a procedural query language used to query the database tables to access data in different ways. In relational algebra, input is a relation(table from which data has to be accessed) and output is also a relation(a temporary table holding the data asked for by the user). Relational Algebra works on the whole table at once, so we do not have to use loops etc to iterate over all the rows(tuples) of data one by one. All we have to do is specify the table name from which we need the data, and in a single line of command, relational algebra will traverse the entire given table to fetch data for you. This is used to fetch rows(tuples) from table(relation) which satisfies a given condition. Where, σ represents the Select Predicate, r is the name of relation(table name in which you want to look for data), and p is the prepositional logic, where we specify the conditions that must be satisfied by the data. In prepositional logic, one can use unary and binary operators like =, <, > etc, to specify the conditions. Let's take an example of the Student table we specified above in the Introduction of relational algebra, and fetch data for students with age more than 17. This will fetch the tuples(rows) from table Student, for which age will be greater than 17. Project operation is used to project only a certain set of attributes of a relation. In simple words, If you want to see only the names all of the students in the Student table, then you can use Project Operation. It will only project or show the columns or attributes asked for, and will also remove duplicate data from the columns. where A1, A2 etc are attribute names(column names). Above statement will show us only the Name and Age columns for all the rows of data in Student table. This operation is used to fetch data from two relations(tables) or temporary relation(result of another operation). For this operation to work, the relations(tables) specified should have same number of attributes(columns) and same attribute domain. Also the duplicate tuples are autamatically eliminated from the result. where A and B are relations. Above operation will give us name of Students who are attending both regular classes and extra classes, eliminating repetition. This operation is used to find data present in one relation and not present in the second relation. This operation is also applicable on two relations, just like Union operation. This is used to combine data from two different relations(tables) into one and fetch data from the combined relation. For the above query to work, both RegularClass and ExtraClass should have the attribute time.